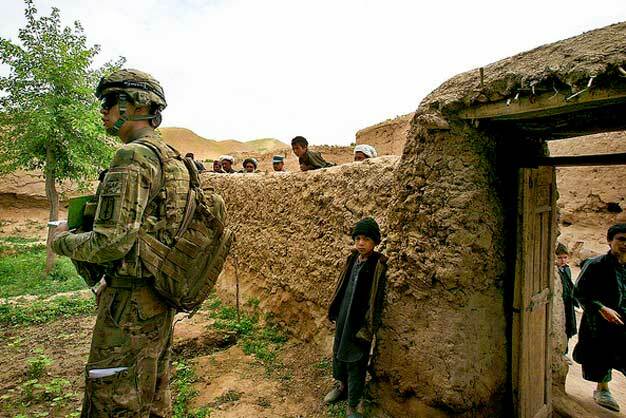 Afghans of all ages observe U.S. Army Pfc. Loren Gaboni and other soldiers from an International Security Assistance Force and Afghan National Police combined joint patrol as they interact with the village leaders. During the patrol, ANP and ISAF troops from the U.S. Army A Battery, 1st Battalion, 84th Field Artillery Regiment, 170th Infantry Brigade Combat Team visited Baghoulmast village to assess their needs and to offer their assistance and partnership. Photo via US Army.